RUSNANO Group will take part in the Open Innovations Forum and Technology Show to be held from October 28 till November 1 at VDNH in Moscow. 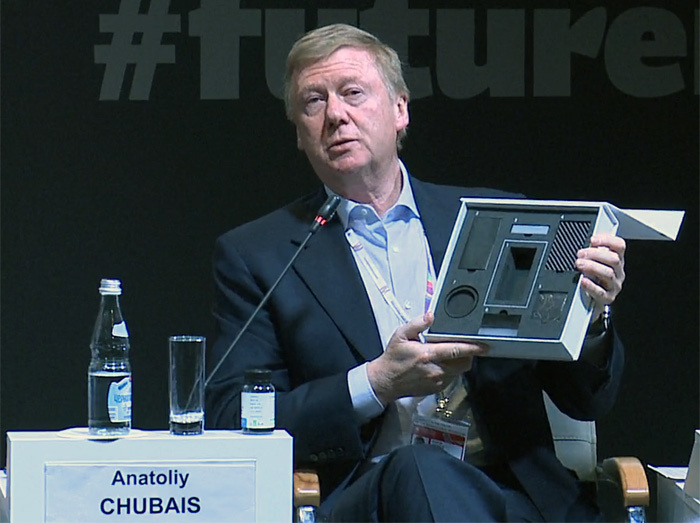 Chairman of the Executive Board of RUSNANO Anatoly Chubais will participate in the plenary session of the Forum and give a speech at the strategy session on Open Innovations Model in Russia. A number of agreements are expected to be signed by the head of RUSNANO: the agreement on strategic cooperation with the Astrakhan Region and the agreement on cooperation between the FIEP nanocenters consortium and Holst Center (set up by IMEC and TNO). Anatoly Chubais will present prizes to the finalists of RUSNANOPRIZE and the Russian Youth Prize in Nanoindustry and award the semifinalists of the All-Russian Nanotechnology Engineering Competition organized for students and postgraduates of 2015. The program of the Forum includes speeches of the representatives of RUSNANO portfolio companies. Igor Shakhray (Hevel) will be speaking about the role of solar energy generation in the energy revolution. Valeriy Gurinovich (Galen) and Andrey Berkov (Department for Programs to Stimulate Demand, FIEP) will make reports on principles of effective technical regulation in construction industry. Visitors of the Forum and Technology Show will get acquainted with the healthcare activities of the Group in sections dedicated to personalized medicine, infrastructure for medical standards and Big Pharma ecosystem. At the RUSNANO’s stand (in hall 75) the products of 16 portfolio companies and 10 startups of the FIEP nanocenters will be presented: thin film electroluminescent displays, healthcare and military products made of nanostructured ceramics, composite materials for construction and aviation industry, multicore semantic microprocessors, coating for high diameter pipes and 3D printers. RUSNANO’s portfolio company Monocrystal (Stavropol) will demonstrate a unique 300 kg synthetic sapphire crystal grown by the Kyropoulos method modified according to the company’s own technology. The company established the production of large diameter sapphire wafers (over 300 mm) and achieved a significant reduction of the end product costs. Analytical company Yole Developpement recognized Monocrystal as the world’s leading manufacturer of synthetic sapphire at 2014 year-end. Hevel, a common project of RUSNANO and Renova Group, will introduce solar modules created in the company’s research and development center at the Ioffe Physical-Technical Institute. This unique domestic product combines the best of thin film and crystalline silicon technologies. The efficiency coefficient of the new generation solar panels is up to 24.7% while world average coefficient is about 16%. In the Robot Zone RUSNANO will demonstrate robot-assisted logistics system RONAVI which allows managing a warehouse without human interference. The system allows increasing the capacity of a warehouse up to 50%, saving money on its lighting and heating, as well as reducing the payroll to 80%. Load capacity of the system is up to 1500 kg; its battery life is 6 hours. The system is designed for large logistics centers, retail chains warehouses and production lines management. The RUSNANO’s stand will traditionally be a platform for interactive activities: this year young researchers will visit Nano Laboratory and for inquisitive high school students NANOpig in a Poke Program will be organized. DNA purification experiments, genome analysis and blood group determination will be available for them at BioLogica workshop sessions. The proponents of projects of the FIEP nanocenters will be giving presentations in the startup bar zone. They will be talking about the latest nanotechnology solutions.